Most people know, and love, Japanese developer Hideo Kojima for the Metal Gear series, a franchise he created all the way back in 1987. For me, though, that's a convoluted mess of a property that's become more unwieldy and pointlessly self-referential with each passing entry. If you feel the same and would like to see a glimmer of why people still regard the man with such adoration and authority, you might want to look to 1988's Snatcher instead. 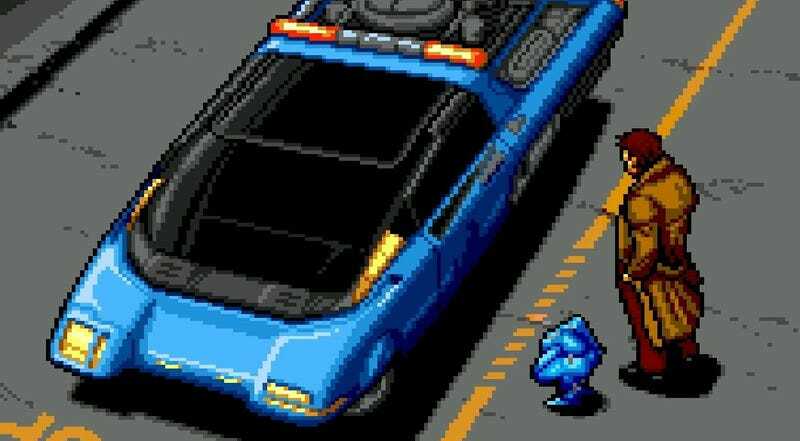 Snatcher is so much a product of its time that it hurts. An adventure game released in Japan in the late 1980's, it's played from a static first-person perspective and relies heavily on searching environments for clues and speaking with/interrogating characters in the game (in other words, scrolling through menus), the only action coming in the form of intermittent "shooting gallery" sequences (Japanese game fans will recognise it as, in many ways, a "visual novel", a genre still popular in the country today). That's not what made the game good back then, though. And it's certainly not what makes it so fondly-remembered today. The player, Gillian Seed, is Blade Runner's Rick Deckard. The game's bad guys, the titular Snatchers, are T-800s from the Terminator series, so much so that the American version had to be edited to avoid a lawsuit. The way the game communicates its post-apocalyptic setting is very reminiscent of Katsuhiro Otomo's Akira. And the manner in which the Snatchers move about the modern world taking the place of actual humans (not to mention their very name) is straight from 1956's Invasion of the Body Snatchers.Games always have, and always will, "borrow" from other mediums like film, comics and books. What Snatcher did went a little beyond this, though; it almost stole visual cues and design elements straight from some of the best science fiction works of the 1980's. So intent was Kojima with paying direct reference to his favourite characters and properties that in one scene, in the Outer Heaven nightclub, you can see a crowd shot featuring sci-fi legends like Giger's Alien watching "entertainer" Isabella (pictured up top) shake her stuff on stage (again, this was changed for the American version of the game, movie characters replaced, bizarrely, with Konami characters like Sparkster). This hat-tipping wasn't limited to other people's stuff, either; Metal Gear fans will find a ton of references to Kojima's first game in Snatcher, from Fox Hound to the aforementioned Outer Heaven to the name of your humorous sidekick in the game, which is, well, Metal Gear. Stealing content from other works normally doesn't get you very far, but most of these "influences" had something in common: they were all adult science-fiction, dealing with technology in a dirty, practical fashion, and featuring dark storylines in which not everything comes up smelling of roses at the end. For fans of this kind of stuff, works of their ilk were strangely rare, and since at the time these series' fanbases (even in Japan) had a lot of dovetailing, Snatcher was a rare opportunity for them to indulge their interests, especially since the game didn't shy away from including at times very graphic imagery of things like corpses (though some of these were toned down for the game's release in the West). The other reason Snatcher burns on in many people's hearts is its writing. Kojima is well-known for his love of telling a story, and nowhere does this work to better effect than in Snatcher. Unlike Metal Gear, which is at times simple (owing to it being an action game) and others bloated (owing to the fact it's been around for decades), Snatcher's adventure game setting means Kojima was able to weave his various influences together into a strong, coherent storyline that boasted surprisingly strong writing, both in terms of framing the story and in your dialogue with the game's characters. Of course, it helped the game also looked gorgeous, especially in its later updates (originally released in 1988 on Japanese computers, it would later be ported and seriously upgraded for the PC Engine, Sega CD, Saturn and PlayStation). It wasn't just the graphics being updated between versions, either; later versions added improved intro sequences and voice acting, while the Sega CD edition (the only one ever released in the West) even had support for Konami's light gun peripheral to make the shooting sequences easier. For all the game's critical success, though, it's never seen a sequel, the only other game released bearing the same name being 1990's SD Snatcher, a remake of the 1988 original in the style of a top-down RPG, complete with cute character portraits. If you've never played Snatcher, you can check out a high quality playthrough of the Sega CD version here (or, you know, given the fact its only Western release was on a long-dead platform you could find yourself a copy). Also, if you speak Japanese, the first instalment of a radio play based on the franchise, Sdatcher, is now available for download.